The Play Mode is where you can play a Kit without getting too far into the details. Here you have the four macro sliders and access to all navigation buttons that take you elsewhere in the instrument. We’ll discuss the Play Mode in further detail in following sections, but the most important page to check out initially is the Browse Mode. 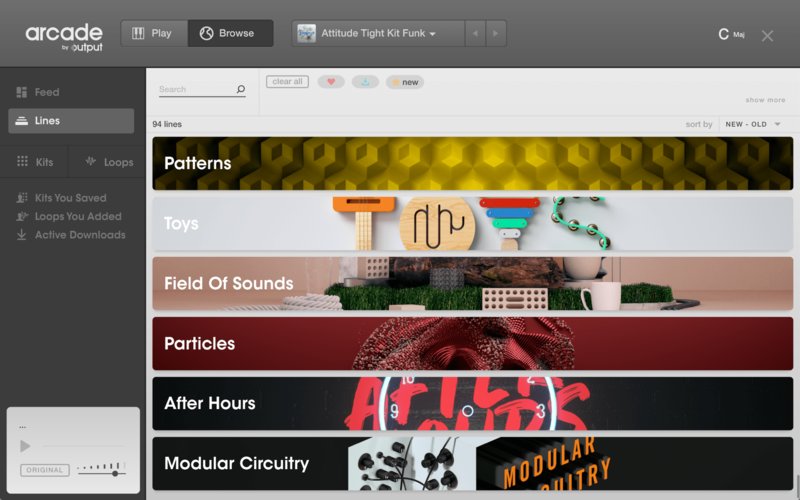 ARCADE’s Browser is where you search for, preview, download, and access all sounds. When you load ARCADE onto a track, you’ll first arrive in the browser. 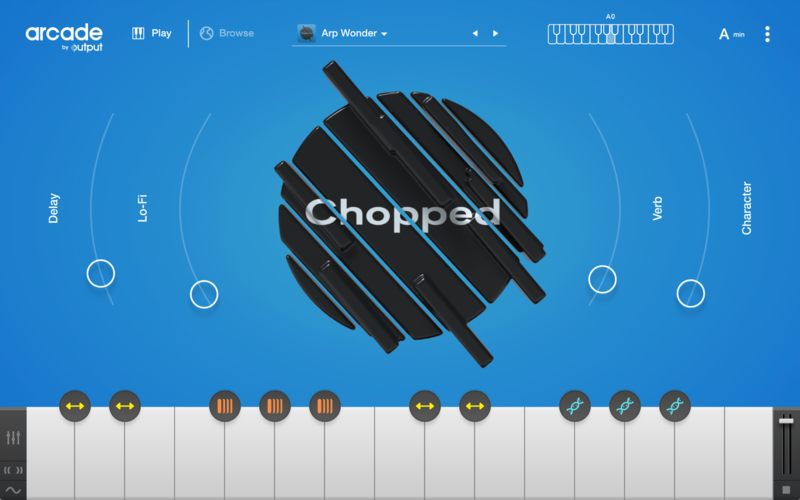 Here you can choose to load a Kit or start building your own by dragging Loops onto the keyboard. You can access the browser from any page by clicking the Kit name in the header of any page. ARCADE connects to the internet from within your DAW so you can browse and download what you want, whenever you want. 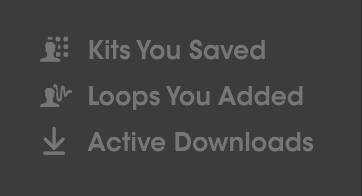 New Lines, Kits, and Loops will be curated and added here by Output on a regular basis. You can search through Lines, Kits, and Loops using either text search or with the provided Tags. At the top of the Browser you’ll see three icons which you can click to sort results. The heart icon will show all Loops, Kits, and Lines you have favorited. The star icon will show you all the newly released content. You can also access your User Kits, and view any active downloads by clicking the corresponding tab on the left-hand side. Below the Kits and Loops You Saved and Active Downloads section you’ll see the Preview section. Here you can start or stop the playback of Loop and Kit previews, as well as control the volume of the preview. 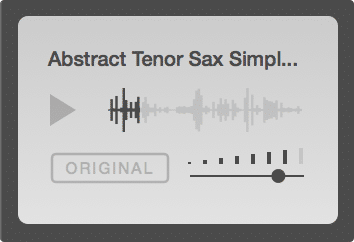 We designed the previews to always play back to fit your session key and tempo. If you’d like the audio preview to play in the original key and tempo (not conformed to your session), click the Original button (the button will be in a darkened state). In this state, you’ll hear the audio preview in the key and tempo that it was originally recorded in. Note: Loops will automatically pitch shift to work in your session key when the Original button is turned off. 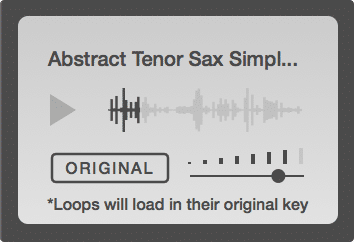 This way, Loops will sound the same in the browser as they do when loaded into the instrument. This means that if Original is toggled on, loading a Loop from the browser will not automatically pitch shift to match your session key.